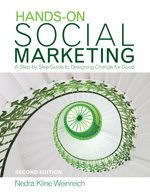 It’s that time again – time to announce the next session of Social Marketing University! Many of you know that I have been offering SMU trainings since 2006 as a 2-1/2 day introduction to using social marketing to promote health and social issues. This year, taking into account many people’s requests for the next level of social marketing training beyond the basics, I will be offering the Social Marketing University Advanced Course. This 2-day training is for people who are already familiar with the fundamentals of social marketing who are looking for new ideas and insights, including those who have taken previous SMU trainings in what I am now calling the Foundations Course. The Advanced Course will be offered on September 14-15, 2009 in Berkeley, CA. We’ll focus on topics like audience segmentation techniques, real-world research and evaluation, effective approaches to behavior change and will spend a full day on using online social media strategically. For more information, pricing and registration, see the SMU information page. Don’t be disappointed if you can’t make it to Berkeley this time, or if you would like social marketing training but are not quite ready for the Advanced Course. I will also be offering a series of four webinars on social marketing fundamentals through Social Marketing University Online during the summer. You can attend this series to prepare for the Advanced Course, or just to bone up on individual social marketing topics of interest to you. Take a look at the SMU Online information page for detailed descriptions of the webinars and pricing (4 for the price of 3!). I’m also happy to offer a 10% special discount off the Advanced Course for my blog readers (enter discount code “BLOG”), and I hope you will join me at one or more of these events! Keep up with the latest on SMU by joining the Facebook Fan Page or following the @SocialMktgU Twitter account.